Horace de Saussure, a noted Swiss naturalist, observed in the 1760s, "It is a known fact, and a fact that has probably been known for a long time, that a room, a carriage, or any other place is hotter when the rays of the sun pass through glass. To determine the effectiveness of trapping heat with glass covers, de Saussure built a rectangular box out of half-inch pine, insulated the inside, and had the top covered with glass, and had two smaller boxes placed inside. When exposed to the sun, the bottom box heated to 228 degrees F (109 degrees C) or 16 degrees F (9 degrees C) above the boiling point of water. Horace de Saussure was unsure of how the sun heated the glass boxes. Today we can better explain what happened. Sunshine (photons) penetrated the glass covers. The black inner lining absorbed the sunlight and converted it into heat. Though clear glass allows the rays of the sun to easily enter through it, it prevents heat from doing the same. As the glass trapped the solar heat in the box, it heated up. Its inventor realized that someday the hot box might have important practical applications, as "it is quite small, inexpensive and easy to make." Indeed, the hot box has become the prototype for the solar collectors that have provided sun-heated water to millions since 1892. In the 1800 people started experimenting with the suns solar power by a metal water tank, painted black, into the sun to absorb as much solar energy as possible. These were the first solar water heaters on record. The downside was that even on clear, hot days it usually took from morning to early afternoon for the water to get hot. And as soon as the sun went down, the tanks rapidly lost their heat because they had no protection from the cool night air. The shortcomings of theses bare tank solar water heaters came to the attention of Clarence Kemp, who sold, in Baltimore, Maryland, the latest home heating equipment. In 1891, Kemp patented a way to combine the old practice of exposing metal tanks to the sun with the scientific principle of the hot box, thereby increasing the tanks' capability to collect and retain solar heat. He called his new solar water heater the Climax - the world's first commercial solar water heater. Kemp originally marketed his invention to Eastern gentlemen whose wives had gone off with their maids for summer at some resort, leaving their husbands to fend for themselves. The solar water heater, Kemp advertised, would simplify housekeeping duties for this class of men already burdened by their wives and domestic staff’s absence and unaccustomed to such work as lighting the gas furnace or stove to heat water. 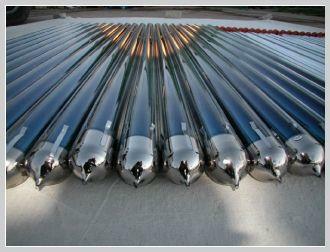 Modern day solar evacuated tubes use the latest magnetron sputtering deposition techniques, and layers of aluminum-nitrogen and aluminum base. This produces tubes that can harness nearly 92% of the suns energy.This new technology has caused the world to look at the renewable source from a different light. Currently there are over 1.5 million solar water heaters in the USA over 1/3 of the Asian population use solar water heaters, and this number is rapidly climbing.